Grant Connell, the1995 World No. 1 ranked doubles player and holder of 22 ATP Tour titles, is a tennis Champion for our kids, setting an example for our young players that, yes, they too can do it. But has our junior development program created a problem for itself, and players, by fiddling with its ranking system? The 2009 junior tennis calendar started in January with a new system and a new way of calculating the rankings which is causing concern among parents and players. They cannot understand the new ranking system. The points just don't add up in many cases. Sometimes they're even at odds with head-to-head results. The young players are especially confused and worried. Players and their parents are asking for more transparency. There is no shortage of talented young players in B.C. 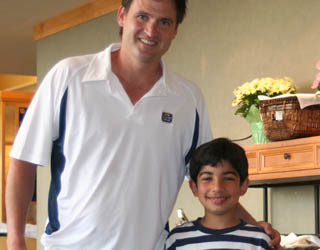 ( A recent example: Eleven-year-old Alexis Prokopuik and twelve-year-old Daniel Raw won the women's open and the men's open respectively in a recent tournament at the West Vancouver Tennis Club!) The development of these players, and of their commitment and motivation, occurred in an open and fair ranking system which they could all understand. The fairness of the rankings now, however, is in question. Let's get all stakeholders - the players, parents and coaches - involved in a discussion of this matter and of any other major changes that effect player development.